During the school year, our family is on a rigid schedule - especially at mealtimes. Our children are eaters, and they are always wanting snacks! The short period of time between afternoon snacks (3pm or so) and dinnertime (5:30pm) is "unofficial mealtime" (aka crazy-time)! It is the end of the day, and they have no patience for mommy or food. I don't want them to be hungry, but I also want them to eat their dinner! And that's where Sabra Hummus comes in to play. Spring break came and went, and it was a reminder that summer is on it's way! Instead of just a week of relaxation, there will be a couple of months of relaxation! Sabra Hummus is a perfect way to introduce an "unofficial mealtime". And trust me, your kids won't be disappointed.... and I'm pretty sure you'll find yourself snacking along with them. It's no secret that Harper LOVES hummus, but it can't be just ANY hummus. The girl HAS TO HAVE Sabra. Even at 5 years old, she knows the difference between Sabra and the imitators. She dips her veggies and cheeses and pretzels in her hummus and she even fights her little brother for it (he loves the Sabra too!). So it was only fitting that we try Sabra's guacamole! And let me tell you, it did not disappoint! Did you know that you can score a $5 gift card if you buy Sabra and Stacy's chips together before February 15, 2016? Well, you can! It's all part of Sabra's Buy, Snap, Score promotion. Just head on over to www.dipzone.com for more information on how you can score this amazing deal! This week, I sent Harper to school with a fun lunch to get her pumped up for the upcoming Super Bowl. Here, she has Sabra guacamole, cheddar cheese squares, slices of sweet peppers, sweet potato chips and green grapes. For a little treat, she has chocolate covered sunflower seeds. And for fun, she has a whistle to blow! You know, so she can play referee for a quick moment (until the lunch monitor takes it away from her). REBEL! Go-GURT Friends eating cantaloupe and grapes, this lunch is perfect for frogs and apes. It is also perfect for your child! Did you know that Go-GURT is THE VERY FIRST yogurt in a tube? The others are just imitators! Yoplait actually came up with the idea of putting yogurt in a tube before anyone else, and what I perfect idea it was! Go-GURT couldn't be any more convenient. There is no mess. No leaks. You don't have to worry about yogurt getting all over the other parts of your child's lunch! It's all contained in the tube. Easy. Easy. Easy. And that's what lunches should be about. Harper's lunch here is in an EasyLunchboxes container. She has a Go-GURT Yogurt tube with cantaloupe and grapes. The large green silicone cup is from the Target $1 bins! The little frog and monkey are from CuteZCute Animal Food Picks Set. Harper has a cream cheese stuffed yellow mini-pepper and a cucumber and cream cheese sandwich in a Wilton Square Silicone Cup. She also has a couple of cheddar cubes and some crackers in a Mini Silicone Cup. While we typically have fresh fruit and veggies in our meals at home, sometimes having fresh produce it is not quite as easy when you're on the run. Del Monte's Fruit Burst Squeezers are the perfect substitute for fresh fruit and veggies because all you have to do is throw it in a lunchbox without having to worry about keeping it cold. We received for review Fruit Burst Squeezers from Del Monte, Inc., and since my children are the connoisseurs of the "fruit pack" as we so lovingly call them, we might really be the best family to review these things! If you didn't already know, fruit packs are pureed fruit and vegetables in a super convenient pack. Believe it or not, purees are no longer just for infants! They are an easy way for your children (or yourself!) to get in a serving (or two!) of fruit and veggies. And with the variety Del Monte has to chose from, there is sure to be the perfect flavor for your family. We have tried all different brands of fruit packs, but the Del Monte Fruit Burst Squeezers are definitely among my kid's favorites. When I do demonstrations in preschools on how to create healthy and fun lunches, I tend to focus on COLOR COLOR COLOR. Of course, I focus on the healthy stuff too, but I really push the fact that kids tend to try more food when it's colorful. I really think that my own kids not only liked the taste of Del Monte's Fruit Burst Squeezers, but they were also drawn to the packaging! Neither one of my children know how to read, so it's fun for them to open up their healthy snack drawer in our pantry and actually SEE the pictures of the fruit on Del Monte's packaging. It helps them to chose whether or not they want the blueberry or the peach-mango flavor. They may not know how to read, but they definitely know their fruit. And Peach-Mango? Yep! PEACH-MANGO! It's delicious too. Tune in tomorrow for a breakfast idea using Del Monte's Fruit Burst Squeezers. Yes, really! A breakfast idea! Go-GURT campers sleeping under the moon, this yogurt doesn't even need a spoon. By now, I'm sure you know about Go-GURT, but if there is any chance that you don't, I'm here to tell you! Go-GURT is the super convenient and super fun way for your child (or yourself) to eat yogurt. You don't need a spoon to eat this yummy goodness. All you need is a couple of fingers to rip open the tube. It's THAT easy! Go out and get your family some. Harper has a super tasty and fun breakfast-for-lunch with scrambled eggs here in an EasyLunchboxes container. The cute little flowers found in the eggs are from CuteZCute Bento 3D Food Picks (we LOVE this set!!). She has a Strawberry Banana Burst Go-GURT tube with cucumber slices and baby carrots. Harper also has cheddar cheese and string cheese cubes, and apples cut in the shape of flowers. I cut the apples by using Mini Vegetable Cutters. All of this is housed in Wilton Square Silicone Cups. For crunch, she has Chinese noodles. A couple of months ago, I randomly stumbled across an Instagram feed that showcased these AMAZING plates. Bright. Fun. Easy. Who makes these? What is the deal with them? How do I get some for my children? These were the thoughts that immediately ran through my head. RE-PLAY. RE-PLAY is a company that believes in sustainability, safety, durability, functionality and affordability. And, well, these five terms quickly became my favorite five words (maybe they kinda already were). Sustainability: RE-PLAY uses recycled plastic to create their products. Recycled milk jugs, to be exact! The recycled plastic is sanitized and put to perfect use. There is nothing better than being able to recycle and reuse! Safety: RE-PLAY selects and cleans the recycled plastics to meet the FDA's strict purity standards, and the final product meets FDA requirements for food/plastic contact. No need to worry about BPA, Phthalates or PVC! You will find none of THAT in RE-PLAY's products. Durability: RE-PLAY can be run through the dishwasher! The bright colors will remain and the plastic will look good-as-new each time you wash. Our 2-year old is tough on serving plates, and I can not tell you how many times he's thrown his plate on the floor. Still intact? YEP! Looks like I just took it, brand new, out of the box. I even kinda heard that you could run the plate over with a car and it would still remain intact? What? I haven't personally tried this, but maybe I should! I'll keep you updated! Functionality: RE-PLAY designed their products with early-eaters in mind. You all know how much I LOVE compartmentalized plates for our children! It is all we use in our house. RE-PLAY's feeding sets are a perfect size for small eaters, and they provide portion control. No need to worry about overfeeding or underfeeding. Oh, and they are stackable too! Space saving in the kitchen is always a big plus! Affordability: RE-PLAY believes that "going green should be rewarded with saving green", this is why their products are REALLY affordable! You can purchase RE-PLAY products through Amazon or at www.shop.re-play.com. Products may also be found at Wal-Mart, Whole Foods, Kroger, and various specialty shops and grocers around the country. They are easily accessible! It's pretty safe to say that we are in love with RE-PLAY. Now that I got all THAT in your head, you really need to go out and purchase these amazing products OR you can enter to win the giveaway that I will be hosting. Yeaaahhhhhh! I'll be posting Harper and Adler's breakfasts and lunches using RE-PLAY products throughout the week on Instagram and Facebook. Check in with me at those spots to get some great meal ideas using RE-PLAY and enter to win this feeding set for your child. It will be easy (you know how I love easy). All you'll have to do is "like" and comment on the posts in Instagram or Facebook and you'll be entered to win. It really is THAT simple. *Disclaimer: Food For Harper received product for review from RE-PLAY, but no other compensation was received for this post. All opinions are solely my own. When it comes to food, I've said that there is nothing I love more than seeing Harper's face when I put lunch in front of her each day. The reaction she has is what keeps me going. The reaction she has is the reason I want to teach ALL MOMS EVERYWHERE how to do what I'm doing. So the feeling I had when I got to see the reaction on the faces of THREE girls may have just been too much to handle. HA! Harper has recently been asking me if she can have her friends over for lunch. For a four year old, my daughter is the communicator of ALL communicators, so it's only fitting that she likes to have company ("company" meaning more than me and her brother) during her lunch time. These three lunches are in EasyLunchboxes containers. They each have a fun shaped hard-boiled egg created with an Egg Mold. The eggs are being held by a Mini Silicone Cup. They also have strawberry hearts with each of their initials by using Letter Food Picks. The apple slices were stamped in the middle with a Mini Veggie Cutter. They each have cucumber slices in a Wilton Square Silicone Cup and crackers with cheddar cheese. My daughter's obsession with cream cheese is at an all time high. If I'd let her, Girl would eat cream cheese with every single lunch. Cream cheese in mini-peppers, cream cheese on sandwiches, cream cheese to dip fruits, cream cheese to dip veggies. I've explained before that Harper is not a fan of celery, so I've made up our own version of "Ants on a Log". Our version is called "Bugs on Some Bark". I've touched upon this concoction before. You can see more about this obsession HERE, HERE, HERE or HERE. It really is amazing how you can create different lunches from the exact same ingredients!! Make sure you're utilizing all your options! If they loved strawberries one day and are sick of them the next day, just try to cut them differently! Sometimes, variety is all it takes! "Bugs on Some Bark" is simply cucumber spread with cream cheese and dried cranberries on top. Your child should try it! Let me know what they think! Harper's lunch here is in an EasyLunchboxes container. She is eating Bugs on Some Bark with carrot sticks, Rold Gold Tiny Twists Pretzels (the pieces you find on the bottom of the bag all broken still taste the same! ), apple slices and a homemade oatmeal raisin cookie in a Mini Silicone Cup. Are you ready for Valentine's Day lunches? You aren't? Well, you better get to it! And I have some good news.... There isn't much to it!! As I said in a PREVIOUS POST, not much goes into creating a lunch for Valentine's Day! You can look at these six ideas and see that I really didn't use any fancy tools! Learn to make that strawberry heart and you got yourself a LOVE(ly) lunch! If you'd like to add some ooomph to it, I'm going to give you a list of what you may need. You want to make a sandwich in the shape of a heart? All you need is the Wilton Nesting Heart Cutter Set to be able to make all different sized sandwiches. You and I both know that not all bread is created equal. Sliced bread is not as easy, as well, sliced bread. They come in all different sizes and this set will help you to use the correct size cutter for your bread. Your child doesn't like sandwiches? Well, how about you make him/her a hard-boiled egg in the shape of a heart? Hard-boiled eggs are so overlooked for kid's lunches! It's such a shame because eggs are healthy and full of protein. It's super easy to create fun egg shapes by using an Egg Mold! OK, so you don't want to buy a sandwich cutter or an egg mold because you feel like you'll only use it once a year and you don't want it taking up space in your kitchen cabinets? Go out and get some Wilton Jumbo Heart Sprinkles and sprinkle those things in some yogurt with a side of crackers and fruit! You can pick those up at Target or even your grocery store near all the Valentine candy. Wah-lah! Insta-LOVE lunch! Heart sprinkles? Phooey! Who needs heart sprinkles? My child is not going to like the LOVE-y dovey crunchy heart sprinkles in their yogurt! If you have that idea in your head, run out to your nearest Trader Joe's and pick up some of the Cinnamon Schoolbook Cookies and you can spell out your own little sweet message. I mean, what child (or adult!) doesn't LOVE cookies? Oh, you don't have a Trader Joe's in your city? Oh, man. Well, here's what you do. Learn to make those strawberry hearts! P.S. That bowl of yummy-looking goodness on the bottom in the middle? Oh, that's granola with heart sprinkles! You want the recipe? Well, check back in a few days and I'd LOVE to give it to you. But you'll have to go out and get some of those sprinkles. Sometimes you have days where things just need to be easy. You've been woken up at 3am by your 26 month old who has been climbing out of his crib since he was 22 months old. It takes you almost 2 hours to get him to go back to sleep.... only to be woken up at 6am by your 4 year old who usually wakes up at 7:30am. You feel totally defeated and you get up just hoping and praying that 8:50am comes quickly because you know you'll be out the door dropping both of your kiddies off at preschool so you can go home and take a little nap before you have to pick both of them up at noon. Only this morning, you look outside and see (a lot of) snow on the ground and you look at your phone to see a text message saying that school has been canceled. You're having the WORST DAY and it's not even 8am. And this is when the super easy lunch comes along. I know I always talk about Harper's lunch being easy, but this is EASY EASY. Like, there is nothing to it. And it still looks pretty, right? Harper's lunch here is in an EasyLunchboxes container. She has a butterfly peanut butter and honey sandwich created by using a Crust and Sandwich Butterfly Cutter. I also added a bit of sprinkles on top of the sandwich. Yeah, those sprinkles stick into those little nooks and crannies! She also has blackberries and snap peas in an Mini Silicone Cup with a Butterfly Food Pick. I LOVE LOVE LOVE these food picks because they are different depending on the way you have them in the food. At one angle, they look like faces, and from the top, they look like something totally different. 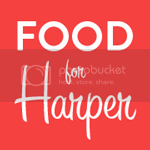 Food For Harper has an exciting little thing coming up next month. I will be doing a demonstration for Harper's preschool to help raise money for the school's end-of-the-year party! I'm so nervous, but definitely looking forward to meeting with parents face-to-face to help them with lunch ideas for their little ones. Last February, I did a demonstration in Brooklyn with some children in New York City Public School 217 and it was amazing. You can read more about that HERE. It was such a wonderful experience to hang out with the kids and talk about having fun with food. I'm sure the demo at Harper's preschool will be a hit! Harper has been having a difficult time learning her numbers and letters so we've been really focusing on making learning fun. Harper shuts down if she thinks we are sitting down to "learn". So what better way to make learning fun than to work the learning into a lunch!? We focused on 4s in this lunch! Harper's lunch here is in a Yumbox container. She is eating blueberries and Laughing Cow Creamy Original Swiss Cheese (did you notice there are 4 mini stars on the wrapper?) with Trader Joe's Sweet Potato Tortilla Chip Rounds (I gave her 4 chips.... yum, delicious!). These chips are perfect for dipping into homemade guacamole. She also has green grapes and kirby cucumber slices. The little number 4 cookie is from Trader Joe's Cinnamon Schoolbook Cookies. We are here in New Jersey digging ourselves out of the snow. The "blizzard" of all existence was, well, not quite that. I was explaining to a friend that the storm that took place was the best possible case scenario. It caused so much panic and chaos that my husband didn't have to go into the office for a couple of days, but there wasn't much snow to be had. When I say "wasn't much snow", there was still about 6-8 inches. Not much for where we live, but it was enough to have fun! And, even better, it was an excuse to not leave the house. Lots of warm cuddles and love was had in our home over the last couple of days. Awwwww. With all that being said, it's the end of January which means it's time to start preparing for LOVE lunches. Yes, my friends, it's almost Valentine's Day! I'll soon be putting together a round up of Valentine's lunches from last year, but until I do that, I have a little secret. You do not need fancy tools for Valentine lunches. All you need is to perfect the art of the strawberry heart that you see here. Harper's lunch is in an EasyLunchboxes container. She has red pepper slices, Rold Gold Tiny Twists Pretzels in a Wilton Silicone Square Baking Cup and a stick of string cheese that I cut in half to make two little cheese people. 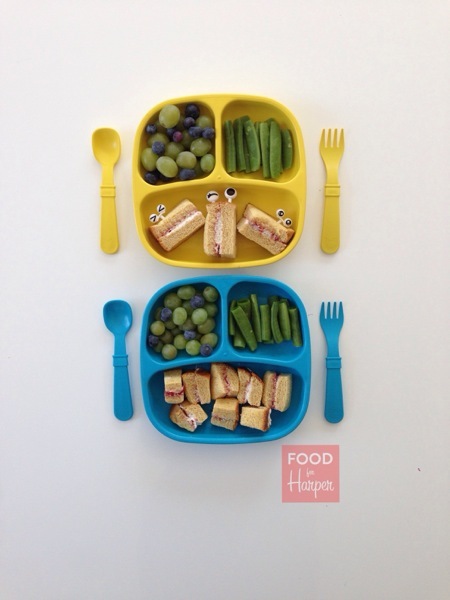 Those two little cheese people were created by using these Fun Eyes Bento Food Picks and it couldn't have been easier! She also has a strawberry heart (trust me on this one, learn how to make them!) and a hard boiled egg. I feel like we are finally back into the swing of things since the holidays. For us, it always takes just as long to get back into the groove than the holiday lasted! Harper and Adler's daddy was home with us between Christmas and New Years, and as much as we love him home with us, things definitely get all out of sorts with eating and schedules. I like when things get shaken up, but I love when things get back into order. Today, I'm going to show you two very similar lunches! Unlike Banana Bagels, which showed two of the exact same "friend" lunches, these are a little different. 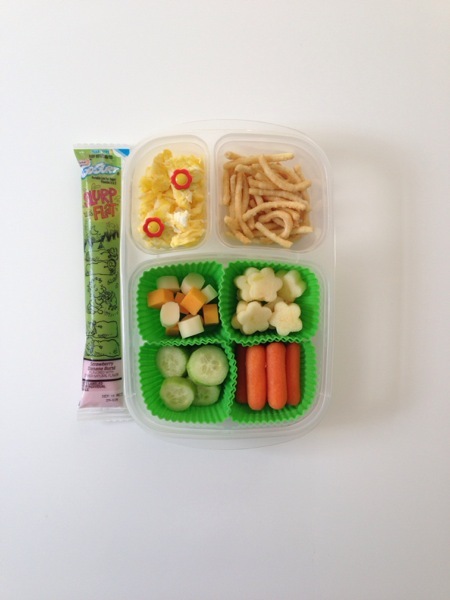 These lunches are what my children, Harper and Adler ate the other day. If you look closely, you'll see some tweaks. Of course, two children don't always prefer the same foods! Harper LOVES blackberries, but Adler will not eat them. Adler loves red grapes, but Harper isn't a fan. And if you didn't already know, our little two year old had a playground accident about 9 months ago and he lost his two front teeth. So a lot of his foods still need to be cut up, especially vegetables. I'm going to start showing more foods that we feed our little Adler! Not only will you get some ideas for what a toddler may like to eat, you'll also get to see how I make two lunches just a little different to accommodate each child. These lunches are prepared in an EasyLunchboxes container. They each have Rold Gold Tiny Twists Pretzels and POLLY-O 2% String Cheese. The larger Wilton Square Silicone Baking Cups have orange mini peppers and fruit (blackberries for Harper, red grapes for Adler). The smaller silicone cups are M.V. Trading Mini Silicone Food Cups. To mold Harper's egg in the shape of a bear, I used the Kotobuki Plastic Egg Mold. This sandwich container is how Food For Harper all began. 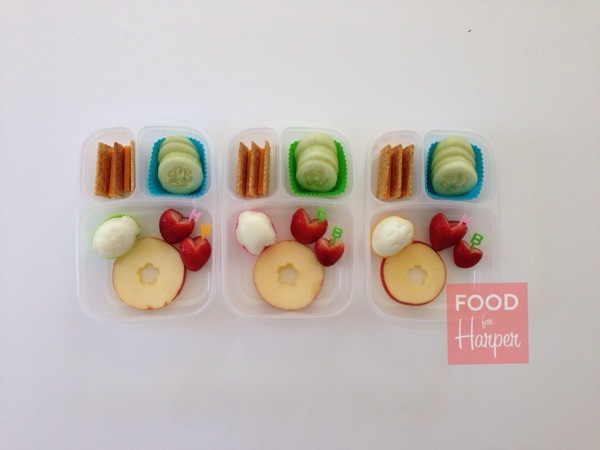 I've been getting a lot of inquiries lately about how I started to create these fun lunches for Harper. The answer is simple. 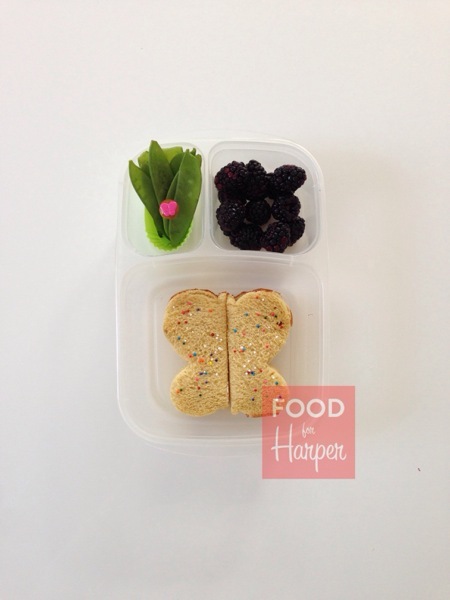 I first started creating fun lunches when I was working and leaving Harper with her nanny each day. She was 2 years old (about the exact same age our little Adler is now!) and I was using too many sandwich bags for her lunches. The five food groups that you see in her lunches now were going straight into five different sandwich baggies. And after she was done eating what was in those bags, out they went into the trash! Not too environmentally friendly! Harper was a bit obsessed with Elmo at the time, and my mom got her an Elmo Sandwich Box. It sat in a drawer for months when one day, I pulled it out to use as a "plate" for her dinner. And that is when it all fell into place. I was making her lunches in this little Elmo sandwich box for months and months. Every. Single. Day. Then, Harper decided she was going to grow and she was going to need more food. HA! She was graduating from Elmo, and I had to decide which box was a good box to move up to. That's when I found EasyLunchBoxes. And then, well, lunches just started to get prettier. But it all started with just a little box. A little box I found in a drawer. A little box that I had no idea would forever change the way I'd do lunch. Now, there's no going back. You're a star. No, really, you are! And, so is your child! Harper has been working on learning her letters and it's so much fun to incorporate letters into her lunches. It's such a great way to help her learn! Harper's lunch here is in an ECOlunchbox 3-in-One. This box is a bit pricey, but it's worth it! It's very compact but it fits a lot of food. Harper is eating a hard-boiled egg in the shape of a star. I created the star by using a Star Egg Mold, and I've put the egg into a Silicone Food Cup to keep it from sliding around. She also has snap peas, and her cheddar cheese cubes are speared with Letter Food Picks to spell out the word STAR. For her fruit, she has half of a pear and a few mandarin orange slices. The pear is stamped with a star by using a Stainless Steel Vegetable Cutter. She also has oyster crackers bought at Trader Joe's. I love when lunches have a theme. Obviously, this lunch has a pig theme and Harper LOVED IT. It was, by far, one of her most favorite lunches I have ever made. And honestly, I had a lot of fun making it for her. And you know what else? It was EASY! Harper's lunch is on a plate I picked up at Target. I love the compartmentalized plates they sell. She has banana slices and cucumber slices with a piggie stamped peanut butter and honey sandwich created with Torune Bento Sandwich Mold. This set is one of the best. It comes with four different animal stamps and it's inexpensive! The cucumber slices has a pig face food pick. She also has yogurt with nonpareil sprinkles because sprinkles make everything more fun! I've never actually been a fan of New Year's resolutions. I feel like the time to make a change is when you want to make the change - not just at the turn of the year. But this year, I've made a few resolutions for myself. What are your New Year's resolutions? Are you planning on eating healthier? Are you planning on exercising more often? 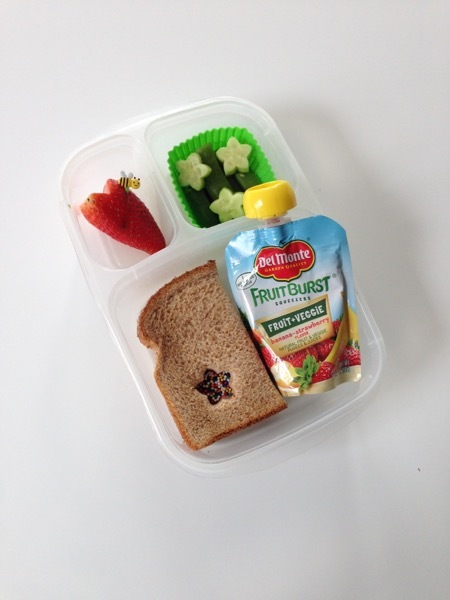 Are you planning on creating fun lunches for your child? My resolutions are all of the above! In addition, I've decided to be more proactive about socializing my children. For the holidays, my husband and I decided to have a stay-cation, and we scheduled many play dates for Harper and Adler! The two weeks home during the holidays were great. We got to spend time with each other as a family, but we also had a lot of fun with our friends. Now that we are finally settled in our new house and town, I'm planning on making 2015 one of the best years ever! Here, you will see two of the same lunches, and that's because Harper had a friend over for lunch one day over the holidays. Of course, her little girlfriend wanted a fancy lunch too! It was fun to see both of their faces when they saw what they were about to eat. Harper's friend was excited because it was different for her, and Harper was excited because she was able to share her special lunches with her friend. Both lunches are in an EasyLunchboxes container. They have Trader Joe's mini bagels with cream cheese. They also each have a mini banana! I was so excited to find these at the grocery store because they are fun and fit perfectly into a small lunchbox! 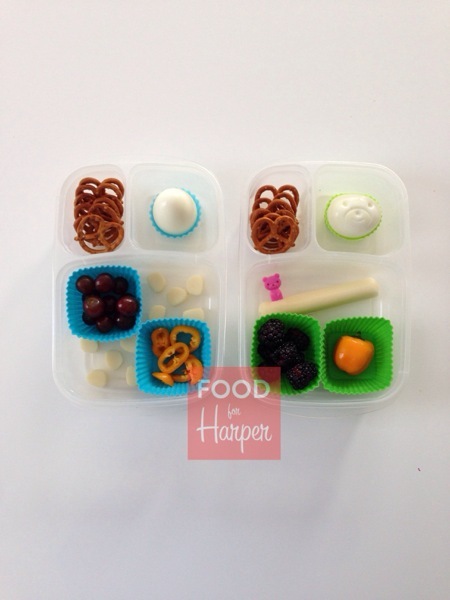 Also included in these lunches are blackberries and blueberries in a Baking Essentials Silicone Baking Cup. These cups come in a pack of 12 and in a variety of colors. For their veggie, they have cucumber slices with a very cute CUTEZCUTE Animal Food Pick. Need something to do with all those left over mashed potatoes after Christmas dinner? You need a recipe? Yes, a recipe from me! I've had people ask me what kinds of recipes I have up my sleeve. You know, since I write a blog on children's lunches, I should SURELY have some recipes to share too! Truth is, I don't have too many. Just as the lunches I create scream "EASY! ", so do the rest of our meals. My husband and I eat a lot of raw vegetables and fruit. Crackers. Cheeses. That's about what we eat. My husband and I enjoy Trader Joe's already prepared meals too. It's not that I can't cook. It's just that life right now is tough with two small kids at home, so why not make it easy and pick up meals that are already prepared? That's my rant for the day. But this recipe? You're gonna want to try this one. I am a pro at sides. I can whip up some amazing sweet potatoes and broccoli casserole (my mom's recipe). I can make some amazing guacamole (that's a whole different post). Ask me to roast a turkey, and you're asking the wrong girl! But ask me to make you all the sides you'll eat for a Thanksgiving or Christmas meal, and I'll have you covered! Garlic mashed potatoes are my specialty, and I usually make wayyyyy too much. And you know why I make too much? Because I whip up some fried mashed potato balls a couple of days later. So are you ready for the recipe? All you need to do is use your left over mashed potatoes. I make garlic mashed potatoes. They are good. They are REALLY good. But they are even better when I add bacon and cheese and roll them up into little balls. 1. Combine the cold mashed potatoes, bacon, 1 egg, onions, cheddar cheese in a large bowl. 2. Shape the mixture into balls. 3. Roll the balls into the flour. Then roll the balls into the remaining four eggs. Then roll the balls into the breadcrumbs. 4. Heat the olive oil in a frying pan. Fry the potato balls, a few at a time until they are golden brown (they should be crispy!). 5. Remove balls with a spoon and onto a paper towel to drain excess oil. 6. Serve warm and with sour cream! Each day, I get a good chunk of time to spend with Harper while our little guy takes an afternoon nap. We do crafts or we read books or we work on puzzles. Sometimes we'll watch a movie. Once a week, we bake something. Today, we are planning on making some pumpkin muffins because we haven't yet had enough of pumpkin flavored things this year. Yum!